Kick your shrimp and grits up a notch by adding artichokes! 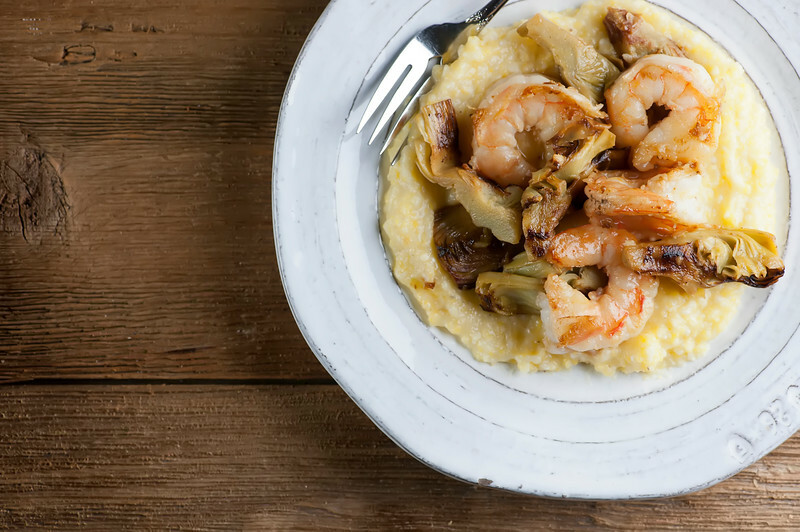 This easy recipe for shrimp and grits with artichoke hearts is a perfect comfort food supper. Shrimp and grits, I love you way more than a Northern girl should. 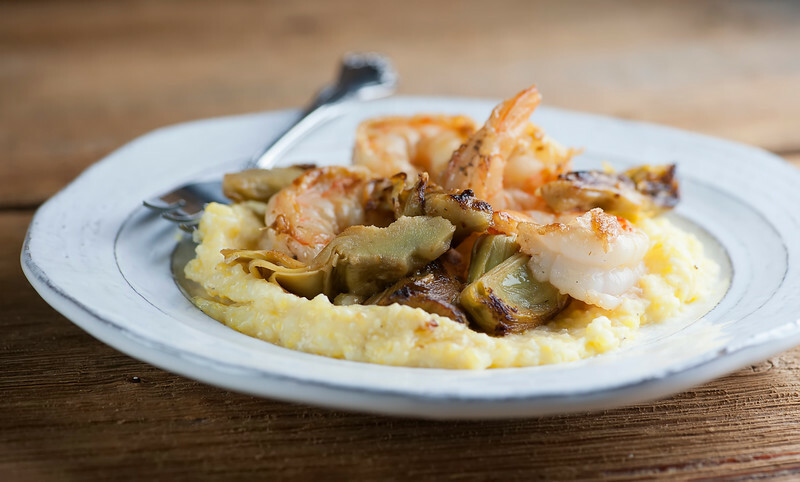 Maybe it is the Southern husband’s influence, but I have never met a shrimp and grits recipe I didn’t like, and this one is no exception, because it adds artichokes, one of my favorite veggies on earth. The shrimp and artichokes are cooked in a delectable lemon garlic butter sauce, and then you spoon the whole thing over some grits that have been kicked up with a little butter and parmesan cheese. It’s shrimp and grits at the next level. It’s downright scrumptious. Let’s make it! As always, the grits I recommend above all others are the pencil cob grits from Anson Mills. They are a little spendy, but there’s a reason why you see them all over the place now on restaurant menus – they are simply the best grits in the world. As for the artichokes, don’t worry…you aren’t going to be doing battle with whole artichokes. Nope, this recipe is as easy as getting a package of frozen artichoke hearts and just remembering to defrost them in time for supper. Have I reached the pinnacle of shrimp and grits with this version? Let me know if you have other versions I need to try! Heat oil in a large non stick skillet over medium high heat. Add artichokes and saute 5 minutes. Add chicken broth, shrimp and garlic and saute 6 minutes. Add lemon juice, 1/8 stick butter, salt and pepper. Remove from heat, cover and keep warm. Cook grits according to package directions and reduce heat to low. Stir in cheese and remaining butter and stir until melted. Ladle grits onto plates and top with shrimp and artichokes. Grind fresh pepper over all. Updated from an earlier Framed Cooks post – now new and improved! And I grew up in the South and never had Shrimp and Grits. I can't eat shrimp ! this is so frustrating ! I am going to see if chicken will work lol .. love artichokes too .. yummm! Chicken would absolutely work! Grill it, shred it and then cook it as you would the shrimp – basically just to warm it up. Yum! I made this for dinner tonight and it was so delicious! I think next time I'll use about half the butter. Love the addition of artichoke hearts to this traditional dish! Looks tasty! I’m a Northern girl who LOVES grits — and shrimp — and shrimp and grits… but the thing I’m not crazy about most shrimp & grits is that they include bacon and/or sausage, which to me overpowers both the shrimp and the grits. This recipe sounds SO good!! I will have to try it.